@mrconventrix I know right? Straight !Braeburn is not possible. @scribble He was the one in the bed next to rainbow dash. You just didn't recognise him without his coat, coat, and hat. Congratulations @trister As a result of a popular being deleted due to its content, you now have your first ever popular notice by default. How does this make you feel? @purplephish20 And yet, I haven't even got one. Rising Superstar Eric Tyler Tyler & Tyler , Toothpaste Pony! @trister or @minti. Just not at the moment. @comradeconventrix @purplephish20 Why not all of them? @woona http://browse.deviantart.com/?order=5&q=Braeburn Browse and enjoy. @scribble Oh Lordy Lordy! What are you wearing today Braeburn???? Bit Shift Saved , Stumperman , monsutaa kaado! @scribble @mushi @greydragon412 @hugmaster Freakin' !saved. @purplephish20 hey, I don't suppose the site's logo could be this for a while? @ecmc Oh god that one in the middle!!! Pony soundboard for WP7 you say? @ceruleanspark Actually, I used it once at the Birmingham meet. @purplephish20 @scribble @flaxx drew it ages ago. Isn't it great? @thelastgherkin There needs to be a !Braeburn equivalent. @thelastgherkin sigh.... what name is flaxx using now? Bronies like Rainbow Dash because people of low intelligence are frequently attracted to loud noises and bright colors. Scribus, -, Pony and It's a secret like this. I am an idiot, monsutaa kaado! and - repeated this. @eaglehooves I don't like them, but I don't hate them either. The only characters I /really/ dislike are Fluttershy and Angel. @eaglehooves Implying Trixie doesn't hate them to the point where she would flay them alive for ruining her show and reputation. If you were a pony, you could just behead them two and bring their heads to Trixie, and she would at least befriend you. @scribble Today, I experienced a shocking reveal. I was not member of !Breaburn until today. I noticed when tasting some delicious !Braeburn and wanting to tell RDN. 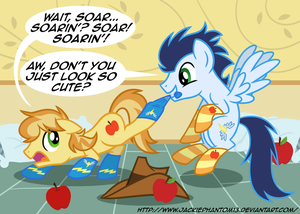 @hakupony You need to make up for it by dumping your !braeburn folder! 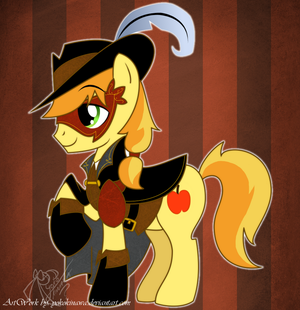 @eaglehooves One does not simply not become gay for !Braeburn.